In November of 1915, Maud Tabor of Lawton, Michigan became the fifth wife of undertaker-turned-real estate salesman Joseph Virgo, who reportedly told Maud that he didn't want any children. The two of them had known each other for years and had been romantically involved prior to the wedding. But afterward, Joe and Maud evidently didn't hit it off very well, because on February 1, she returned home to Lawton, leaving her husband and her married name behind. 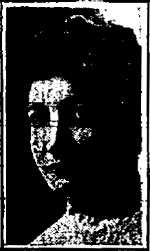 On May 1, 1916, a few months after the death of her father, 46-year-old Maud vanished. Stories circulated in town that Maud had gone to a western ranch for her health, that Maud was teaching in Salt Lake City, and that she was out west scouting out valuable mining property. Suspicions arose, since Maud had not taken leave of anybody and nobody got a letter or post card from her. Sarah refused to discuss the topic with neighbors, who dismissed this refusal as part of Sarah's eccentric personality. Eventually her brother Walter began to tell people that Maud had died while out of town. 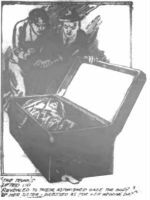 On November 20, 1919, Maud's sister, Florence, noticed that there was something under a pile of old shingles in the basement of the family home. She moved some shingles aside and saw that the object was a trunk. Grabbing it by the handle, she started to drag it into the middle of the cellar only to have the end pull off. Protruding from the end of the trunk was a human foot. Florence immediately fled to a neighbor's house. The neighbor summoned the police, who opened the trunk and found a dead woman, clad in a white shirtwaist, black skirt, and white stockings. Doctors and undertakers examining the body found it to be in a remarkable state of preservation. It had, in fact, been embalmed. Even though the nose was missing, there was little doubt that the face was that of Maud. Both Walter and their mother were arrested. Sarah Tabor gave multiple stories about how Maud had died and about why she had kept the body in a trunk in the basement. The only consistent item was the date of death: May 1, 1916. Investigators worked at untangling the tales and eventually concluded that either Maud's mother or her estranged husband had perpetrated an abortion on her, using chloroform as an anesthetic, and Maud had died during the process. They also arrested Virgo. Eventually Walter Tabor told police that his mother had confessed to him that she had perpetrated the abortion herself. Eventually, Maud's mother was the only person tried in the case. Her first trial resulted in a hung jury after 36 hours of deliberation. They were stuck at a vote of 8 to 4 in favor of conviction. The second was dismissed due to lack of evidence. She had spent nearly all of her wealth on attorneys in order to keep her freedom. On Saturday, April 14, 1928, Dr. T. D. Goodman was called to see a young woman named Bessie Kouns. He found her in a great deal of pain, with considerable swelling and tenderness of the lower abdomen. He treated her for several days, but her condition was not improving so on the 17th he had her admitted to Stephenson Hospital in Ashland, Kentucky. There, her condition continued to deteriorate. On April 24, the peritonitis had caused bowel obstruction, requiring surgery. Prior to the surgery, which Bessie did not expect to survive, she made a deathbed statement to Dr. Stephenson. She told Stephenson that at 7:00 on a Saturday evening, she had gone to 60-year-old Dr. Henry C. Dorroh's office to keep an appointment for an abortion. Dorroh had been drinking and didn't at first recognize her. She reminded him of the appointment. He cussed and told her to get on the table. He approached her with an instrument that he dropped on the floor, then picked up and used on her. He "nearly killed her", Stephenson testified that Bessie said. Stephenson's testimony was supported by Mr. Watt Prichard, who was present at the time Bessie made her declaration. Despite the surgery, Bessie died from septic peritonitis on May 1 at the age of 29. When the case went to trial, Dorroh insisted that he had treated Bessie in February, but only for gonorrhea, and that the treatment might had caused an abortion had Bessie indeed been pregnant. The expert testimony was that the described treatment would indeed be appropriate for gonorrhea, but testimony was divided on whether it would cause an abortion. Dorroh was found guilty by a jury that included six women, but his conviction was later set aside and a new trial ordered.